When one good habit triggers another, the speed of success doubles. I can hardly remember what my mornings look like these days. It’s taken years and much trial and error, but I have a routine now that needs no thought to be completed. Each action, all morning long, is pre-scripted, memorized, and controlled by habit. I wake up and put my running clothes on. A 5-mile run leads to a shower, breakfast, and then my most important task of the day. The same thing happens, like clockwork, every… single… day. What I—and many others, perhaps yourself—have constructed is what I like to call a habit ladder—an automatic system that quickly transforms you from a heap of unconsciousness to a productive human being. A morning routine is just one example of a habit ladder, though. The same concept can be applied across every aspect of your life to make the important actions you want to take quick and painless. And the trick isn’t so much in what you do, but the order you do them in. Why do you bite your fingernails without thinking? Get distracted from important work? Eat poorly? Likewise, why do you exercise without the slightest protest? Get your hardest work done first? Floss your teeth every day? The answer is you’ve built a habit—an mini-system that, once created, you no longer think about. It’s your brain’s way of offloading all the work required to get through the day. Image courtesy of Charles Duhigg. Take flossing, for example. It’s a habit I implemented after the 25th scolding by my dentist. At the beginning of every habit is a cue. This is the thing that tells your brain, “Okay, it’s time to start this habit loop.” For me, the cue that it’s time to floss is when I’ve finished brushing my teeth. Once your brain spots a cue, you go into autopilot; you’re driven by your routine rather than conscious thought. I go directly from brushing my teeth to rolling a waxed string around my fingers without a pause. And every habit ends with a reward—the reason you’re driven by the cue and routine in the first place. For me, it’s the release of tension knowing my teeth won’t fall out of my head. 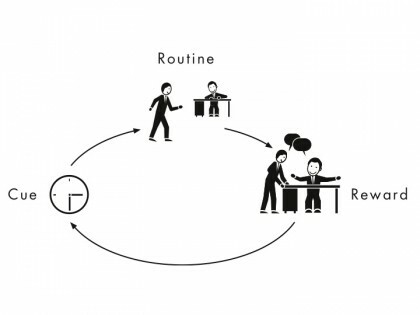 Charles Duhigg explains the ins and outs of the habit loop in detail in his bestselling book, The Power of Habit. Understanding this will help you identify and alter your existing habits, but there’s another tool you can use to help you create new ones faster. When I look at my own morning routine it’s glaringly obvious. Each habit came easily because the beginning of one is triggered by the end of another. When I wake up, that’s a cue to put on clothes. I choose to put on my running clothes rather than work clothes, and that’s my cue to go outside and start running. When I finish running, I’m sweaty, which cues my shower and, by the time I’m out of the shower, I’m ravenous for breakfast which is my cue to eat. Since I’ve just exercised, my body wants a healthy meal rather than sugary breakfast cereal, so I eat a clean meal. Finally, the energy boost from breakfast and endorphins from running give me exactly what I need to tackle my hardest work first thing in the morning. This is called a habit ladder because, from the time I wake up to finishing my first work task of the day, I’m climbing up one rung at a time. Each new step is reached because of the last. Notice from my example, it’s not always the reward from a habit loop that triggers the next. Sometimes it’s a tangential result. The reward from running isn’t “doing better work.” It’s a feeling of accomplishment for my health. But the runner’s high I get as a tangential result boosts me through those few hours of early morning work. 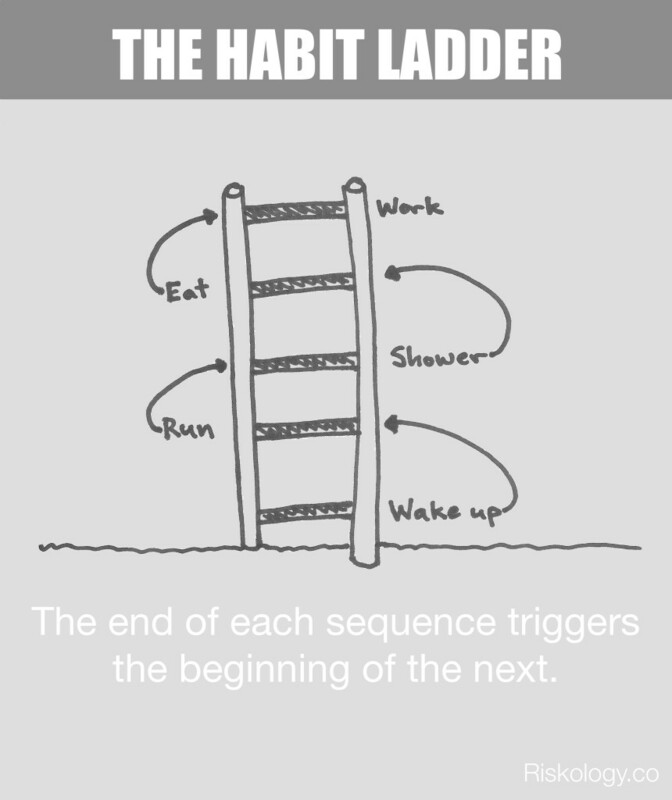 The habit ladder doesn’t just apply to a morning routine, or even just one day. I also use it in my writing tasks where each one I complete to finish an article spurs me on to the next. You could also use it to set yourself up early in the week for actions you know you’ll want to take later but will be worn out if you don’t put the triggers in place now. If you’re working to cement new habits 2 but having a hard time, it could have less to do with the habits themselves and more to do with how they’re arranged. Try looking at each from a perspective of the habit loop—cue, routine, reward—and find opportunities to rearrange them so the reward—or tangential result—from one helps to create the cue for the next. That’s how success becomes automatic all day long. Excerpted; find a full explanation in The Power of Habit by Charles Duhigg. Hat tip to James Clear for helping shape how I think about habits.